What is a Pacific Dampwood Termite? The Pacific dampwood termite is the largest termite on the west coast. This termite does not bring water up from the ground, but they do have high moisture requirements and are often associated with wood decay. There is no true caste system within dampwood termites. Both immature and mature soldiers perform all work and reproduction. Workers are cream to tan in color. Measuring 3/8 to 3/4 inches long, they are in charge of gathering food, colony expansion, caring for the queen and all immature stages. Soldiers are the defenders of the colony. They are 3/4 inches long and have a flattened brown or yellowish brown head with elongated black mandibles. Their primary enemy is ants, usually carpenter ants. Due to the size of their mandibles soldiers are unable to feed themselves. Swarmers are reddish brown with brown wings. They have small swarms periodically throughout the year. Dampwood termite swarmers are attracted to light and it is common to find them caught in spider webs near exterior lights. Dampwood termites are usually found in tree stumps and fallen tree branches. On structures they can be found in leaky roofs, leaky windows, leaky tubs or showers, sub areas with inadequate ventilation or plumbing leaks, or even old wood decking. Our pest control company will have special baits used to eliminate termite colonies, including the queen, without disturbing the nest. Eliminating the high moisture from the structure is the key to control the dampwood termites. The best thing to do if you discover Pacific dampwood termites is call a Portland Pest Guard specialist ASAP. 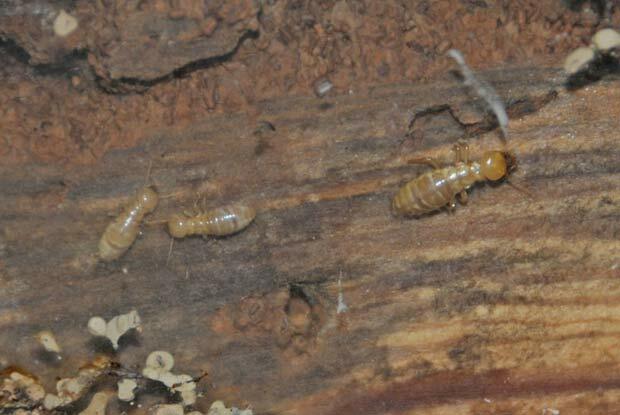 Give us a call today at 503.720.8559 to learn more about Pacific Dampwood Termites or to schedule an inspection!